You can download a PDF of the St. John the Baptist Marriage Preparation Guidelines here. Marriage fills us with joy and gratitude. That is why we take the preparation and celebration of your wedding ceremony so seriously. Through the years, the many beautiful weddings at St. John the Baptist have built a tradition of family and parish life that is very important to us. Parishioners of St. John the Baptist are welcome to be married at St. John’s. A parishioner is someone registered, actively participating in the sacramental life of the parish and supporting the mission of St. John’s. A six-month period of preparation before the wedding is required. Please contact Fr. Carl before making any plans to be married at St. John the Baptist. The cost to use the church is $250.00 for parishioners; a $50 deposit is necessary to hold the date. St. John the Baptist Parish church is also available for non-parishioner weddings. A six-month period of preparation before the wedding is required. Please contact Fr. Carl before making any plans to be married at St. John the Baptist. The cost to use the church is $350.00 for non-parishioners; a $50 deposit is necessary to hold the date. You can ask one of the priests or deacons at St. John the Baptist to officiate your wedding; you may also invite a priest or deacon of your choosing to prepare you and to officiate your wedding. If the priest or deacon is from a diocese other than the Archdiocese of Saint Louis, he must provide a letter of suitability from his local Ordinary. Your priest or deacon will complete all of the necessary paperwork and will assist you with planning your wedding ceremony in conjunction with the guidelines of the Catholic Church and the Archdiocese of St. Louis. All proper forms and dispensation(s) shall be delivered to St. John the Baptist Parish Office no later than 30 days prior to the wedding. The Pre-Nuptial investigation form must be completed. The FOCCUS (marriage assessment tool) must be taken. Baptismal certificate dated within the last six months. Participate in the Archdiocesan Marriage Preparation Program. website at www.archstl.org/marriageprep and follow the directions. Those seeking marriage in the Catholic Church are expected to be practicing their faith. It is a good custom to seek out the Sacrament of Reconciliation (Confession) at the beginning of the preparation period and once again just prior to the marriage, so that you are spiritually prepared to receive the Sacrament of Matrimony. If either party has been previously married, an annulment from the Catholic Church may be necessary. The priest/deacon preparing you for marriage will help you with any necessary paperwork. Please note…A date for your wedding cannot be scheduled until the annulment process is completed. A wedding coordinator is assigned to each wedding scheduled at St. John’s. Sue Salisbury (314-393-4914) will be available to assist you, answer your questions and will be present at the rehearsal and wedding. She will contact you shortly after we receive the necessary forms. Sue’s fee ($75.00) is not included in the Church fee. A Catholic Church is a most sacred space, for within the walls of the church the Blessed Sacrament is reserved in the tabernacle. Because of this unique presence of Christ, certain behaviors are expected. Activities appropriate in a mall or reception hall are not acceptable in a Catholic Church (i.e. loud talking, yelling across the church, talking/texting on cell phones or any electrical devices, etc.). ALL CELL PHONES SHOULD BE TURNED OFF. Food, drink, gum or smoking is never allowed in any part of the Church. In addition, alcohol is not allowed on the church premises before, during or after the rehearsal or wedding. There is a time and place for everything. With an aging facility, it can be difficult to heat or cool the church properly at all times. Please know that we do everything possible to maintain the facilities and regulate the temperature at a comfortable level. Weddings may be celebrated on Friday evenings (time negotiable) or Saturdays at 10am and 1:00 PM. Since we offer the Sacrament of Reconciliation (Confession) beginning at 3:00 PM on Saturday afternoon, we ask that you vacate the Church as soon as possible so that the carpet may be vacuumed before confessions. Due to the penitential nature of the season, weddings generally are not scheduled during Lent. Due to church services, weddings are not scheduled on the First Friday of the month. It is recommended that your rehearsal be scheduled two days prior to your wedding. If there are any last minute details that need your attention, you have an extra day to do so! Photographers may not enter the sanctuary (the carpeted area of the church). Photos are allowed in the center aisle during the procession and recessional only. Once the wedding has begun a discreet presence should be maintained. Photos may be taken from the choir loft. Posed photos are not allowed in the sanctuary prior to the ceremony, but are allowed after ceremony. Posed photos may be taken in other areas of the church and church grounds. Video cameras may be located on the side, outside the sanctuary. AFTER THE CEREMONY, GROUP PHOTOS SHOULD INCLUDE THE BRIDAL PARTY AND IMMEDIATE FAMILY ONLY. PHOTOS MUST BE COMPLETED BEFORE 3:00 PM CONFESSIONS. It is your responsibility to notify your photographer/videographer of these rules. Please remember that our church is not a photography studio. Your wedding is part of the daily routine of parish life. Once celebrated, we have other Sacraments and Masses for which we must prepare. We appreciate your cooperation. Secular music is not appropriate for a religious ceremony. If you need an organist, Lois Horak, the parish organist/choir director, may be available. Please call her to discuss your selections at 314-570-6887. Lois’ fee ($200.00) is not included in the Church fee. We do not require any decorations for the wedding. The sanctuary of our church is beautiful already. If you do supply live flowers for the sanctuary, it is the custom to leave them in Church. Florists are to be instructed to remove additional candles, bows or decorations within one half-hour of the ceremony. Boxes or other disposable items must be disposed of either by the florist or ushers. The main aisle is 100 feet in length. There are 13 pews in the front portion of the Church and 17 in the back portion of the Church (on both sides). If you wish to use candle stands, bows or flowers in the main aisle, they MUST NOT be taped to the pews. Please use freestanding holders or clamps that fit over the pew to avoid scratching the wood finish. THROWING RICE, BIRD SEED, CONFETTI OR BLOWING BUBBLES IS NOT ALLOWED. THESE ARE FORBIDDEN BY THE INSURANCE AGENT OF THE ARCHDIOCESE OF ST. LOUIS AND MUST BE STRICTLY ENFORCED HERE AT ST. JOHN THE BAPTIST CATHOLIC CHURCH. The consumption of alcohol anywhere on the premises before, during or after the wedding or rehearsal is absolutely forbidden. There is a time and a place for everything. 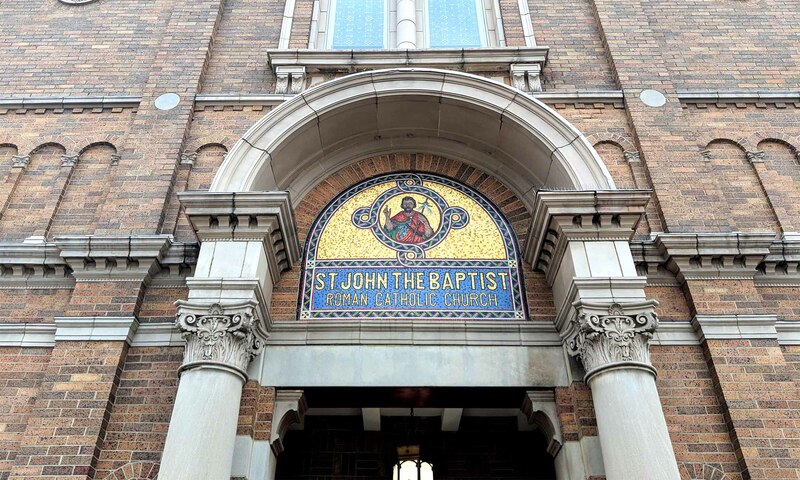 If there is any evidence of alcohol being consumed in or around the church, your wedding may be cancelled at St. John the Baptist. 1st payment: half of total is due on the 15th of the month three months prior to the wedding. 2nd payment: balance due on the 15th of the month one month prior to the wedding. The fee for the parish organist (if used) is $200. This includes a planning session with the couple and wedding. If rehearsal with guest soloist is necessary, then fee is an additional $25.00 per rehearsal session. The fee for the parish wedding coordinator is $75. If the parish provides servers, the fee is $10. A gift to the priest/deacon is at your discretion.